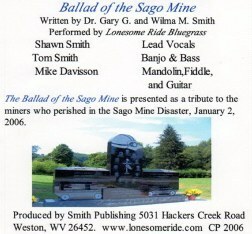 This is an original song written by Gary and Wilma Smith to pay tribute to the twelve men who died in the Sago Mine disaster and to the lone survivor. It is set to bluegrass music and is performed by the Lonesome Ride Bluegrass Band. Thomas P. Anderson, Alva Martin Bennett, Jim Bennett, Jerry Groves, George Hamner, Terry Helms, Jessie Jones, David Lewis, Martin Toler, Jr., Fred Ware, Jr., Jack Weaver, Marshall Winams and Randall McCloy,Jr. and were trapped down there by an awful blast. Just take my hand I'll lead you home." Their families, children and all their friends. 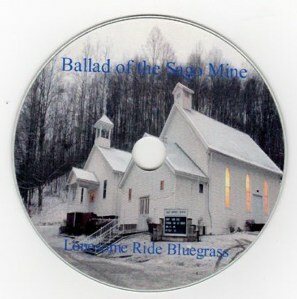 Lonesome Ride Bluegrass To rescue brothers from the Sago mine.